Sounding a warning about the possibility of more fidayeen attacks and terror strikes on economic and religious targets, Prime Minister Manmohan Singh today asked Chief Ministers to personally monitor steps to improve intelligence gathering at the grassroot level and toning up of law and order administration in their respective states. Sources and channels of funding to terrorism have been put under a scanner in India. Authorities concerned have been asked to keep a tab on money transfers that may be used to route the money to fund the “terror-factory” of the dreaded Al-Qaida and other terrorist organisations operating in South-East Asia. Notwithstanding the claims of majority of Chief Minister Arjun Munda, the countdown of the fall of the BJP-led coalition government in Jharkhand appears to have begun after four ministers resigned today, reducing the 18-month-old government to a minority. Even as the water level is receding slightly with the clearing of skies here, the Jhelum is still flowing above the danger mark. 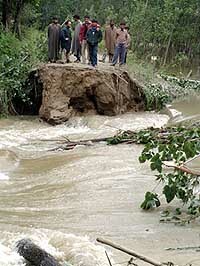 The Jammu and Kashmir Government has declared red alert to meet any exigency arising out of the flood situation. Keeping in view the possibility of heavy floods in the Sutlej and other seasonal rivulets, the district administration today sounded a flood alert in all the villages and other important places situated along the river. The signing of a crucial Indo-French agreement on transfer of technology for production of French cruise missiles by India was put off owing to last-minute hitches, official sources said today. Chandigarh-based doctor J.S. Bedi, charged with issuing fake medical certificate to Vikas Gill, one of the accused in the Jessica Lall murder case, surrendered before a Delhi Court today. A trivial issue of cattle grazing led to the murder of five members of a family including two women and a teenaged boy, while four others were wounded grievously in the Jaria area of the district today. A hike in the pension of Punjab MLAs is on the cards. Besides, there will be an increase in the limit of loans for building a house, purchasing a car, etc. Irrespective of whether Prime Minister Manmohan Singh appoints a full-fledged External Affairs Minister in near future or not, foreign policy will be on top of his agenda from this weekend till the year end. Teaching is the only profession you will be proud of if your student becomes the Prime Minister of the country or if your student becomes an ace scientist.